The largest airport in Puerto Rico is still crippled almost a week after Hurricane Maria. Passengers hoping to escape the devastation have packed the main terminal, which has no air conditioning since it's running on limited emergency power. The conditions were intolerable, said David Mannasmith, an Ohio insurance adjustor who works surveying areas hit by natural disasters such as tornadoes and hurricanes. He and his wife Amber were in Puerto Rico for their third anniversary. They rode Maria out at their resort and left for the airport Friday morning hoping to come home. Instead, they spent four days there, sleeping on hard floors, with little food and water -- and heat and humidity that made it feel like it was over 100 degrees. "There was one vendor that was open, selling bottled water, very limited food," he said. "Everything was operating on a cash only basis. Fortunately we had taken out a lot of cash. A lot of people, some with small children, were running out of cash." Mannasmith said he was told several times he and his wife would be able to get on the next flight only to lose out. Finally on Monday morning they got on a flight to Miami. "We were drenched by the time we reached the plane. The air conditioning was the best part," he said. He said he felt bad for all the other passengers left behind. "There are people we stood on line with for four days, and they're still there," he said. "And they're getting no help." Airlines have started flying larger than normal planes to handle as many passengers as possible on the few flights that can get in and out. Authorities hope to resume international flights on Wednesday. They had originally aimed to do so on Monday. At the same time, many more military, charter and relief operation jets are also flying in and out of the airport, according to the FAA. Commercial airlines are operating many of those relief flights, carrying tons of needed supplies, including bottled water and non-perishable food, medicine, blankets, cots, electrical generators and blood for the Red Cross. And they are sending volunteers to help with relief and recovery, many of whom are airline employees with family on the island. United and Southwest Airlines said they are only operating humanitarian relief flights in and out of the island -- no passenger flights. United's flights have carried 50 pallets of blankets and other supplies for the Red Cross, and nearly 40 tons of water, food, diapers, rope, tarps, and 50 power generators. The relief flights are returning with as many people as they can get on the plane, United said. But conditions in the airport are very difficult. Airlines are having difficulty printing out boarding passes that fliers need to go through TSA checkpoints and board flights. TSA said that some of its equipment has been damaged by the storms, so some screening is being done by hand. The TSA said it is bringing in about 1,100 staff members to work in Puerto Rico, the Virgin Islands and other areas affected by the hurricanes that have slammed U.S. territories over the past month. It said 500 of those employees will deal with the more time consuming screening procedures, with the rest assisting in relief efforts. It is advising that passengers allow two hours for screening. Hurricane Maria hit Puerto Rico and the Virgin Islands on Wednesday, Sept. 20, two weeks after Hurricane Irma hit the islands before battering Florida. Late last month, Hurricane Harvey caused widespread damage along Texas and Louisiana's Gulf Coast. 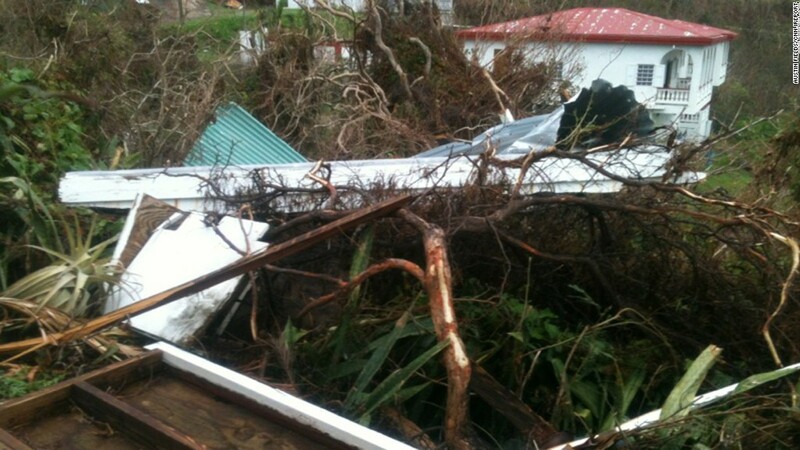 The airport in St. Thomas in the U.S. Virgin Islands has yet to resume commercial flights. The tower there was damaged by Hurricane Irma, and the FAA brought in the mobile tower to help manage traffic. But it had to take that tower back to the mainland ahead of Hurricane Maria to protect it from damage. The FAA airlifted a mobile air traffic control tower back to St. Thomas over the weekend to support relief and recovery missions there. Finding housing in St. Thomas for airport staff is has also been a challenge. The controllers who staff the tower in St. Thomas are being shuttled back and forth to San Juan every day.